Conversation with Pascale Barret about 3D-scanning as a performance and the magmatic qualities of 3D-printed objects. The conversation took place at the closing of her installation This obscure side of sweetness is waiting to blossom in which she installed a collection of artworks and objects developed during a residency in South Korea. Spending time between wild and urban life, mountains with shamans, city politics and cultural heritage, high (new) and low (old) tech, Pascale questioned relations between nature and culture, human, non human and machines. 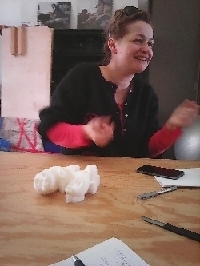 Pascale started to scan plants and roots and tried to solidify forms and patterns into 3D prints and 2D laser cuttings. "The impression I have is that it is like magma, magmatic forms, a little bit monstruous and dangerous, maybe in the way shamanism works. It is like the aura of the plants"
We might understand Item 33 in the inventory the object from Pascale Barret's exhibition as inhabiting an ethics of clumsiness. The awkward lumpy mass of scanned leaves and 3d printing support structures enacts a clumsy wiggling from what has become an accepted path of 3d printing - in which objects are often presented as naturalised accounts of objects or miniaturisations. In contrast to the practice of 3d printing which aims to recreate or reflect "nature", such as the 1-1 copy of a leaf, this work engages with the world that is not made of straight lines and entities with hard boundaries. This inventory item propose to us the possibilities for working with 3d printing in ways that inhabit space-time of plants in a much different way. What we might describe as a less determined way. We might understand Pascale's work as bodies (both human and nonhuman - soil, leaves, roots, climates) similar to what E.K. Tan describes in a chapter of the book from "Exile to Queer Homecoming" - as a body always in motion and (re) orientating towards objects. However as Tan also points out this is also a process of simultaneously disorientating away from objects, hence, reshaping or even departing from the space it inhabits. The movement of both arrival and departure, as they orient themselves towards objects in the space they inhabit. In some ways we might also see this as a proposal to think about the processes of computation as another orientating agency in this entanglement. As the inventory item seems to work against the idea of a 1:1 representation or a simple transparency. It rethinks what it means to compute. As Chun notes for computers to be a machine that makes things ‘transparent’, the fact that they ‘compute’, that they generate images, models and texts, rather than merely represent or reproduce what exists elsewhere must be forgotten (Chun 2012). // In this work we can perhaps generate the proposal of working with processes of orientation not only in our approach to the inventory itself but as a practice of 3d modelling and printing that both takes the body in motion but also as always already orientating towards other bodies. 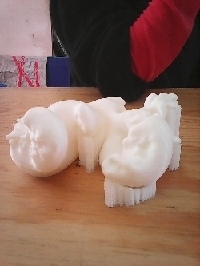 How might this be contrast or be held in tension with the efficiency and desire for efficency, of productivity and reproduction we have wittnessed in 3D modelling. How might we approach practices of Clumsy Computation that work against the muscular straight lines and modes of reduction for efficency? Therefore how might we engage with and always already recognise life or the possibility for life as itself inventive itself. And here we might turn once more to think of the inventory and to rework the notion of invent ripping from its imperial and colonial geanologies to think in terms of a process rather than progress. And in engaging with some of the work done in posthumanisn and feminist materialisms think of inventing and inventorying as moments of creativity and emergence. // See also Cellia Lury's work on Inventive life. One way to think about this might be the framework that Barad proposes of trans-materialities - "that what is at issue here is the nature of matter and its agential capacities for imagina-tive, desiring, and affectively charged forms of bodily engagements." "[M]ateriality of imagining together with the imaginative capacities of materiality" — inventorying might be a process through which we reognise that materiality might both be recalcitrant but also compliant. Innovation proper !! Taking another rotation,we might also note that Pascale's object (as well as others in the inventory) suggests an attention to the volumetrics in the Anthropocene. The emergence of practices of the Anthropocene have tended to naturalise volumetrics,arguing that the volume of (human) bodies on earth now constitute an earth force that will be reflected in future strata - however how might we use the inventory to provoke us to rethink/practice volumetrics, and geological modelling processes - take for instance the use of modelling in mining and other types of extraction - perhaps we might want to consider how this includes and excludes particular possibilities for bodies (human and nonhuman) - perhaps Jesse Lehman's suggestion of "volume without volumetrics" is a useful provocation here. And thinking about the possibility for bodies as well as the impact of largscale extractive practices on bodies, we might also think about some of the proposals coming from feminist technoscience research on microbiomes - bacterium that move between bodies and environments - and suggestions of rewilding of the microbiome (Lorimer) etc. etc.